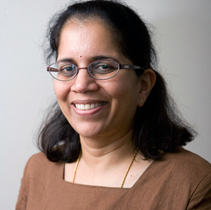 Dr. Rajalakshmi Viswanathan, professor of chemistry and co-chair of the department of chemistry at Yeshiva College, presented her work at the biannual conference on Modeling Protein Interaction in Lawrence, Kansas, from Nov. 8-10, 2018, a major conference that brings together scientists from all over the world interested in understanding how proteins communicate with each other in biological systems. The title of her presentation was “Protein Binding Supersites.” As she explained, “Communication between protein molecules is important for many biological processes. Proteins are very large molecules with thousands of atoms. It is, therefore, important to identify the regions of a protein, protein binding interfaces, that a protein uses to communicate with other proteins. Identifying these binding interfaces enables interfering with the protein activity, either to enhance or disrupt activity by designing suitable molecules. These protein interfaces have been the targets of several modern drugs, such as ipilumimab, a recent drug approved by the FDA to fight cancer. “I have been working, in collaboration with Dr. Andras Fiser of Albert Einstein College of Medicine, to develop methods to identify these binding interfaces in proteins. It is extremely difficult to determine these binding interfaces experimentally as the protein complexes are difficult to crystallize. Hence, there is a need to develop theoretical and computational methods to aid with the identification of these sites. “We studied currently available methods to identify interfaces and proposed a novel modification to existing methods. This modification enables identification of the binding interface without the need to know its binding partner. We termed these interface sites ‘Binding Supersites.’ I presented this work, which is funded by the National Institutes of Health, at the conference; our work has recently been published.